You now know that I am crazy about crèmes brûlées, crèmes brûlées revisited or even something close enough. Why would you want to resist breaking this topping to make it through a creamy vanilla or chocolate spoonful? WHY? Listen to me… I discovered Sahara Tea through a friend, she offered me some teas. Right away, 100 Mysteries attracted me. The coconut prevails but aroma of this mix will seduce you. It seduced me. Although I drink a lot of coffee, this one would totally make a fair trade in the morning! Some Sunday, as I was gathering my ingredients to make a crème brûlée, I opened the cupboard to reach for the sugar and saw the Sahara Tea box… Shall I dare? Shall do I and give it a try? Thank god I did! I used a tea bag in the making of the recipe and it added a great flavor to eat. 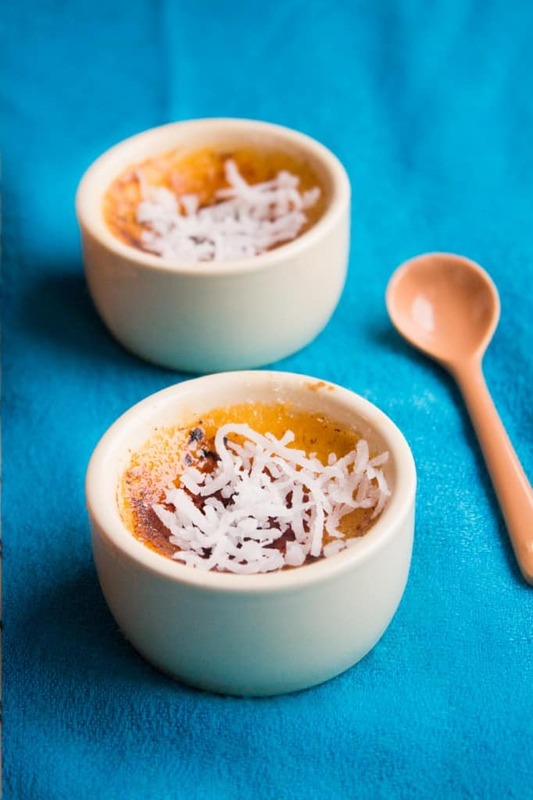 A hint of coconut and a nutty taste is an amazing upgrade to a crème brûlée. Topped with fresh grated coconut! WOOOW! Yes, that’s right! I am so exited of this partnership with Sahara Tea and hopefully a lot of you are going to know them! Sahara Tea is dedicated to deliver the best aromas, taste and health benefits. They offer a wide variety of products: Wellness, organic, classic, tisane or even iced tea. They also offer their own teaware such are pincer or infuser. I really encourage you to go and visit their page at www.saharatea.ca and say hi to Reena, the very sweet owner. Before we get to the super exiting part, let me share my recipe with you! It is very similar to the original one with 2 small extra steps. - Bring the milk to boil. - Remove from the stove and put the tea mix with a pincer or a bag to infuse for 5 minutes. Then add the cold cream to the milk. - Before you jump on it and eat it... Sprinkle with some sugar on top of the crème and with a baking torch, caramelize it. – 2 boxes of 100 Mysteries, my favorite E-VER! Giveaway is open to US and Canada residents. The giveaway is open from Tuesday, July 8th until 11:59 pm EST on Sunday, July 13th. The winner will be contacted by email and will have 48 hours to respond or another winner will be selected. I have yet to make creme brulee but it is certainly one of my favorite desserts when I go out for dinner!! I love your idea of brewing up some tea to use in the creme brulee to add in more flavour! Bravo! What a wonderful idea to combine tea with creme brûlée! That is one of my all-time favorite desserts, made even more amazing with coconut! Thank you Tracey! I loved it, I am so glad I tried it! You should to if you like creme brulee! Wow, I make creme brulee all the time. I have never thought of adding tea, the flavors are endless now for all the seasons! Thanks for the tip! Thanks for the great giveaway! I am a tea fanatic. great giveaway! and your creme brulee looks delish! 100 mysteries sounds like an interesting tea. Yum, a dessert with two of my favorite things! While I do enjoy creme brulee, I’ve never gotten too creative with it, just sticking to the tried and true recipe. I’m now very tempted to give this a try. Creme Brulee is sooo delicious! Thank you for the contest! This recipe looks soooooooo amazing! Thanks for the giveaway! My husband loves looseleaf tea. He would be very pleased if I were to win this prize. I already brushed my teeth but this post makes me want to jump unto my bike (while wearing PAJAMAS) and run to the store to get the ingredients for this deliciousness! Totally making this recipe! Love tea, would be so happy to win. Thanks for the chance. I have never tried Creme Brulee. Would be a great try. You put my two loves in one article, Creme Brulee and Tea! 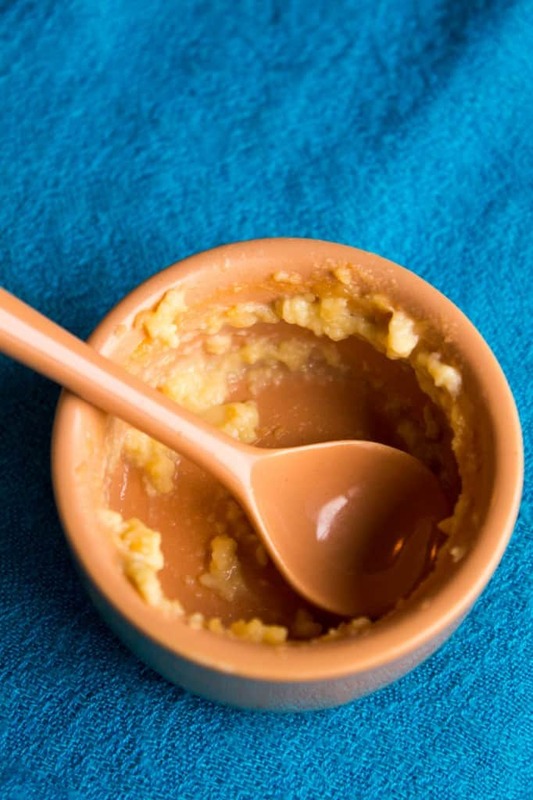 I’m a secret tea granny at heart 😉 My grandma used to make me creme brulee all the time but I have never mastered the recipe, I’m going to give yours a try, thanks so much for posting! Thank you! Let me know if you try it and how it tasted! These look delicious. I would love to try and make them. Thanks for having such an awesome giveaway! Great giveaway!! Thanks for giving us this opportunity! This is such a wonderful prize. I love tea! The recipe looks amazing. I hope I win this, I love tea. Such a great idea, using tea in creme brulee! I’m definitely going to try it.